The South Pole is the place to be this January if you want to raise money for charity. In an epic journey to raise funds for the Australian Red Cross, former Federal MP and multiple world record holder for endurance running, Pat Farmer, reached the South Pole yesterday. Farmer joins a number of other Australians who have journeyed to the South Pole this month in the name of charity. Earlier this week Pro Bono Australia reported that Cheryl Bart skied to the South Pole for her charity FARE, while four adventurers from NSW also recently set out on a trek to raise funds for the Humpty Dumpty Foundation. Pat Farmer, the Sydney father of two made the epic 21,000 km trek from the North Pole through Canada, the U.S., Central America and South America before reaching his final destination, the South Pole. 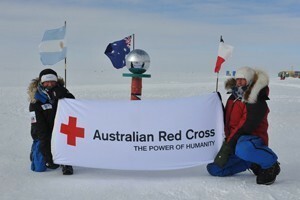 Reports from the South Pole say his support vehicle with his guide and supplies broke down an agonising 8 km from the Pole, so Farmer abandoned the crew, and ran on alone to the Pole, where he broke down with emotion, and planted an Australian Red Cross flag in the snow. “I’ve endured a lot on this run, but the people of Africa and East Timor and South America who have no clean water or have been victims of flood, earthquake, fire and famine do it very tough too,” Farmer said. Farmer has raised millions of dollars for causes during his 20-year running career including Lifeline, Cancer Council, and Diabetes Australia. Red Cross chief executive, Robert Tickner, said that Farmer was an inspiration to all humanity. “Red Cross is extremely proud and grateful to have a supporter like Pat Farmer who has given his all in an amazing feat of physical courage and endurance to raise awareness and funds for water and sanitation projects around the world,” Tickner said.